Fiberglass construction offers a smooth reflective finish, available in quite a variety of colors, which is stain and tarnish resistant. 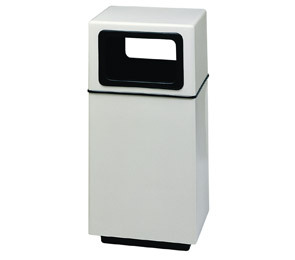 The dual side entry trash receptacles are ideally suited for two-way high traffic areas, providing sanitary hands free waste disposal. Rigid poly liner is included with all units. Colors and images are for reference only. Units are built to order and are non-returnable.